Legend has it that there may also be some dingo blood in the kelpie line, but the truth of that is unknown. A statue of the original Kelpie can be found at Casterton and also at Ardlethan in the Riverina area of NSW. Kelpies have proven themselves to be amazing working dogs for Australian conditions, currently helping to work around 180 million sheep. They can withstand the hot and dry as well as the freezing conditions of Australia’s vast properties. A kelpie will work all day, asking for nothing more than a drink and a feed. A good Kelpie takes the place of many men and is, therefore, a cost-effective option for farmers. They are trained to respond to whistles or commands for about six different actions needed to control a mob. However, Kelpies also possess a keen, natural instinct for managing stock, which can also see them working without direction. They are well-known for their ability to run along the backs of the sheep in a race to move them through when there is a jam. Kelpies are also a good choice, along with border collies, for sheepdog trialling. Dogs competing at trials are a mixture of dogs from stations, who work all week and trial on weekends, and dogs that are essentially pets, whose owner’s hobby is sheepdog training and trialling. Some of these dogs are city slickers that train on small holdings just out of town and travel far and wide on weekends to trial. 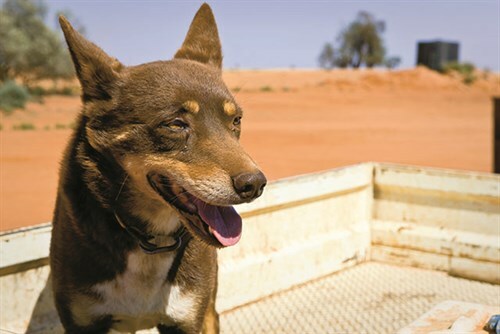 A list of trials can be found on websites from organisations such as The Working Kelpie Council of Australia, West Australian Working Sheepdogs and Queensland Working Sheep Dog Association Inc. Watching these amazing dogs in action is something worth seeing. An internet search will show many tourist attractions throughout the country where sheepdog demonstrations feature. These include Shear Outback in Hay, NSW; Tobruk Sheep Station in Maroota, NSW; Yallingup Shearing Shed & Merino Wool Fashions at Yallingup, WA; and Chesterfield Farm in Scoresby, Victoria. Of course, you should contact these venues first before visiting to check opening hours and the daily program. One of the premier events of the year for kelpie lovers is the Australian Kelpie Muster held in Casterton over the June long weekend each year. As well as serious sheepdog trials, there is also a street parade and other events such as high jump, hill climb, Kelpie dash and triathlon. The festival also has a working dog auction and, this year, the top price paid for a 22-month-old Kelpie was $10,000 — testament to just how much the dogs are valued on the land. Kelpies are a wonderful, loyal family dog, but must be exercised and trained. Kelpies love to learn and are never happier than when they are working with you. Puppies will benefit from puppy pre-school, before moving on to formal obedience training, ideal for all dogs but particularly desirable for a working dog that needs a “job”. Working with you becomes his job, gives him something worthwhile to do and think about. Without you giving him a job, he (like many other high-energy breeds) might just invent his own, such as “gardener” and dig up your lawn and prune your plants, or he may become the self-appointed remover of clothes from the washing line. You can find your local obedience club by contacting the canine controlling body in your state. Once you have basic control, a whole world of options for further activities and sports with this versatile breed will open up to you. These include obedience and rally-o, agility, flyball, herding and treiball, a relatively new herding game where dogs herd fit-balls rather than herding sheep. 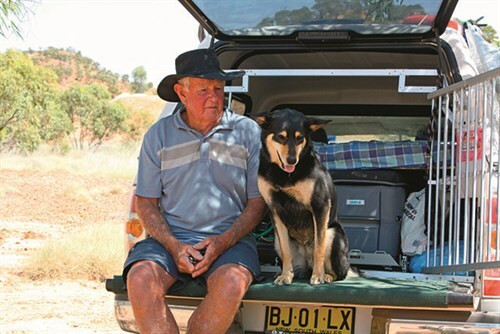 So, whether you are looking for a handy offsider to work on your property or a fun-loving companion, the Kelpie is a great choice — but only if you are prepared to commit to the extra time and effort to keep him happy and well exercised. Check out the full feature in issue #82 November 2014 of Camper Trailer Australia magazine. Subscribe today or all the latest camper trailer news, reviews and travel inspiration.